We have for sale at UKAA a large selection of original antique reclaimed butchers blocks which are available to view at our reclamation yard in Staffordshire. Our original wooden chopping blocks and boards are ideal to use as kitchen central islands, kitchen counter tops or as butchers block tables. Where possible we keep the original bases with the blocks or we can make a bespoke handmade butchers block base to suit your requirements. In need of a butcher block island or chopping block for your kitchen in a specific size and style? Why not design it to your requirements? 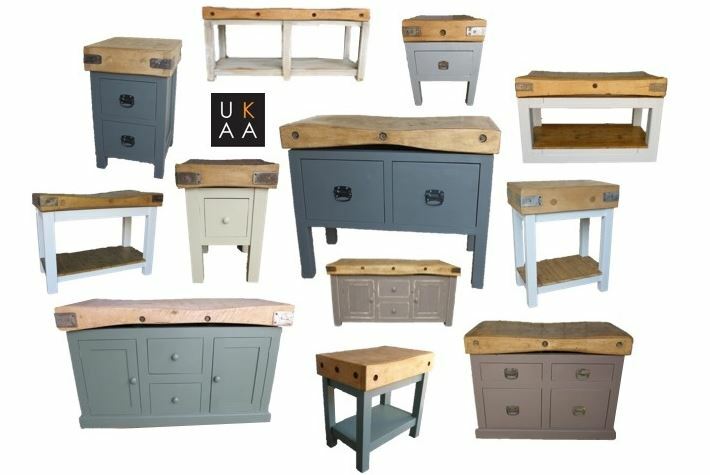 Here at UKAA, we are able to make bespoke butchers blocks and central islands to suit your individual needs. Create butchers chopping blocks to intricately fit into spaces in your kitchen, beautifully complimenting any other furniture. Discover our range of custom butchers blocks for kitchens today. The below items are an example of the butchers blocks we have previously made here at UKAA. Please contact us at the office to discuss your requirements on 01543 222923. We can make a base if required. Our selection of traditional butchers chopping blocks are ideal to use as as butchers tables or free standing kitchen islands. Whether you’re looking for butcher block countertops or butcher block island tops, our extensive range will be sure to fit in with the décor and style of your own home. 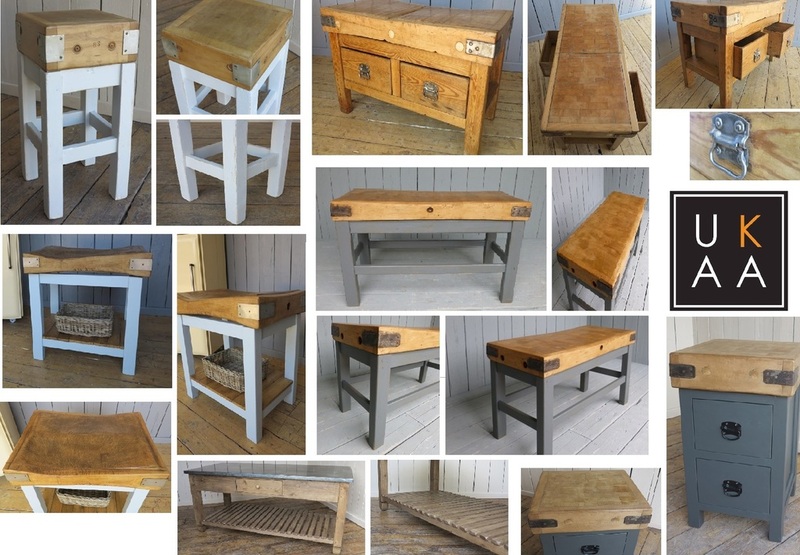 Fully refurbished and polished ready for use, select the bespoke butchers block for you online today with UKAA. Perhaps you’re still looking for the perfect butchers table? When you find the ideal one you want, discover UKAA’s excellent worldwide shipping service for any of our bespoke butchers blocks. For any more information on custom butchers blocks, please contact a member of our customer services team on 01543 222923, or carry on browsing through our full bespoke furniture range.